We’ve been having a few pretty nice days lately! One was so warm, I could have sworn it was an early summer day. So I wandered outdoors with my AM coffee, fully knowing what was ahead. Everything in sight needed pressure washing. Badly. The lawn even needed mowing! Goodness… I was hoping the mower would even start. However before feeling completely overwhelmed, I decided to start slow… and head over to the most prominent focus at hand. The hydrangea bush needed some help as all the flowers were long spent. It was time to clean this up and prune it right! Cut out any hollow sounding wood, as it’s dead. Dead head each spent flower to the closest bud, on an angle. Thin out or shape the bush as desired. The less you cut, the better. 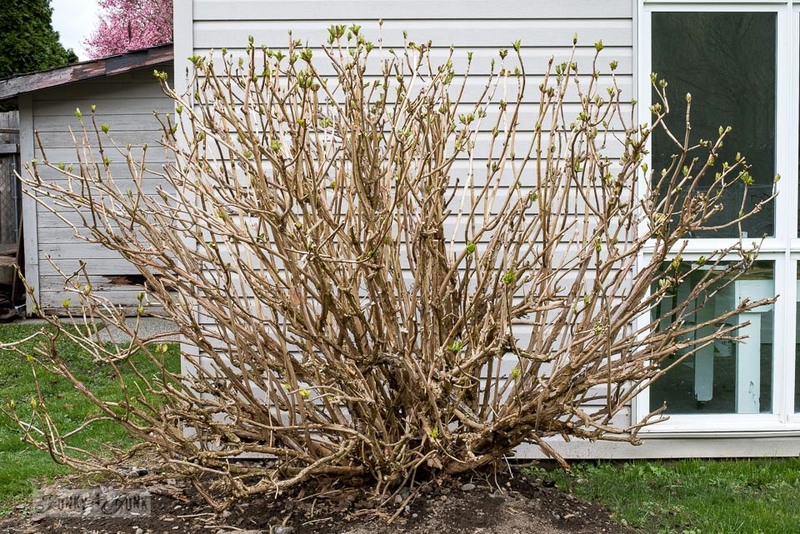 You may already know hydrangeas can be pruned right after they finish blooming. Theory states, next year’s blooms will be on new wood, so one should cut out the old branches, but leave the new shoots. 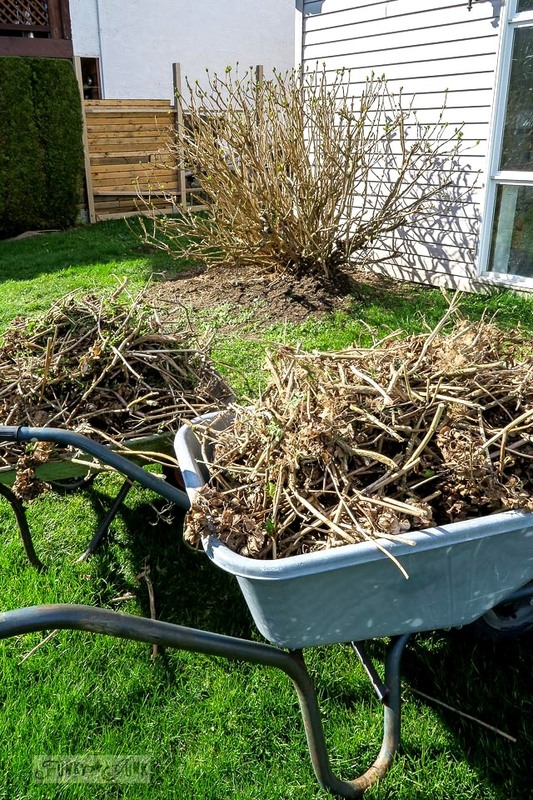 Since I like leaving hydrangea flowers on the bush well into fall due to their best flower drying harvest time, I suppose you could say I do some pruning in the fall in that way. However, I leave the majority of the pruning until spring. I may be different than most that I don’t prune to resize the bush. I prune just to dead head. I find the more you leave well enough alone, the flat out better the bush blooms. Here is a shot of this hydrangea bush in summer. It’s taller than me. The blooms are always so abundant, you can barely even see leaves. I NEVER cut it back hard and the flower yield is always outstanding. Here is the same bush in fall. 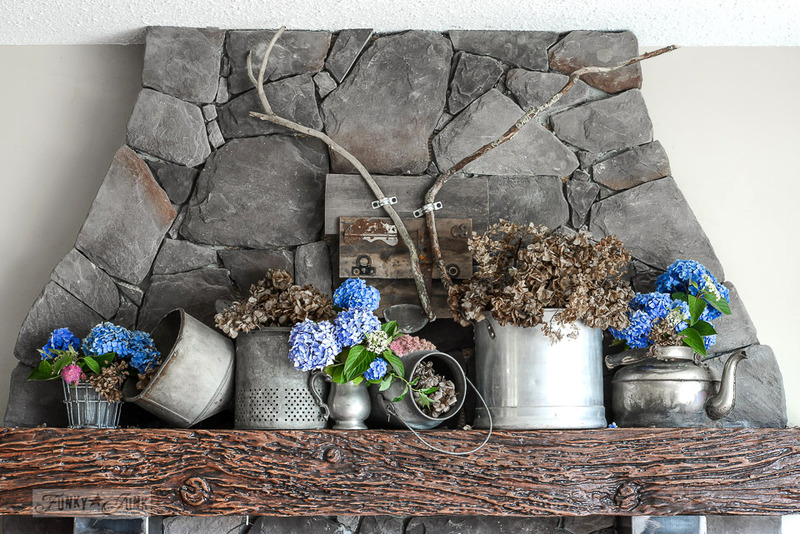 The petals are starting to get crispy, which is the best time to dry hydrangeas for long lasting blooms ahead. And this is how they look during winter. And spring too of course, if you don’t cut them back until then! Yup, I decorate with them then too! However, the bonus on waiting to prune until spring? You can spot exactly where to cut due to the new buds. For me, it helps gauge to not over cut, and know where to stop. Basically put, I’ve found hydrangeas to bloom better if I don’t cut them back too hard. 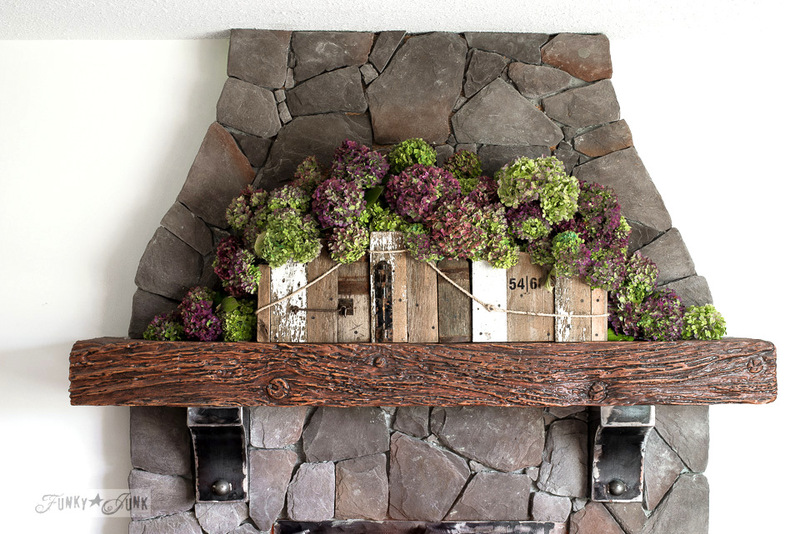 Some hydrangeas bloom from old wood. I’ve also read that cutting them to the ground will produce larger blooms. Knowing what variety you have may require taking a trip to a local greenhouse with clipping in hand for accurate care advice. If something isn’t currently working, perhaps it’s time to try something different. And here’s the new cleaned up bush! Pretty much the same size, however all the dead wood is removed, then it was gently shaped. I have not babied this hydrangea bush like this for the past few years. I’d just dead head, not caring where I cut and left it, so this bush was well overdue needing a proper clean up. I filled up two wheel barrows, PLUS my ‘green’ garbage day pickup bin! See what less flowerbeds is already doing for me? It’s gifted me more time to work with what I have in the right way! 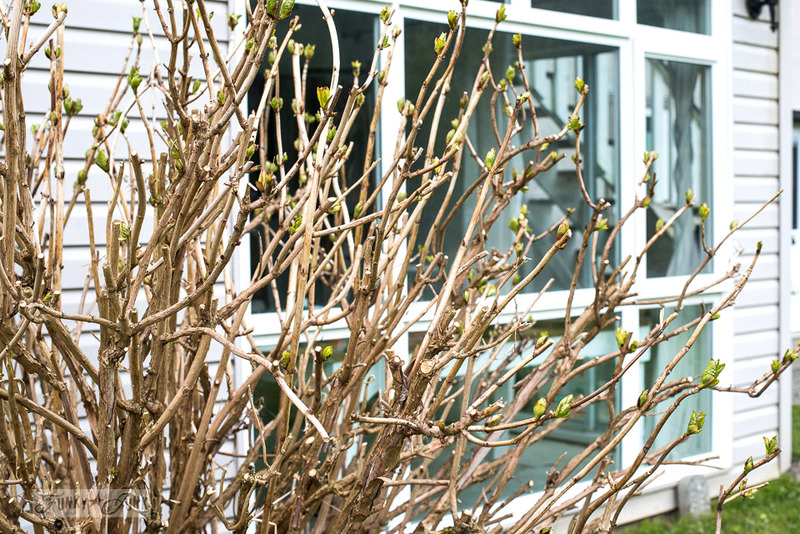 Pruning hydrangeas in spring may not be the proper-proper way, however you certainly can’t argue with a bush that loves to bloom! 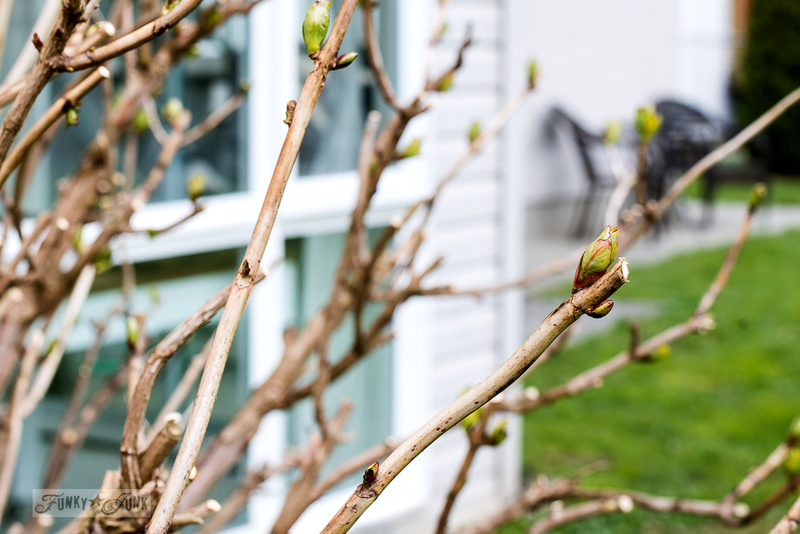 When do you prune your flowering bushes? What yields the most blooms for you? 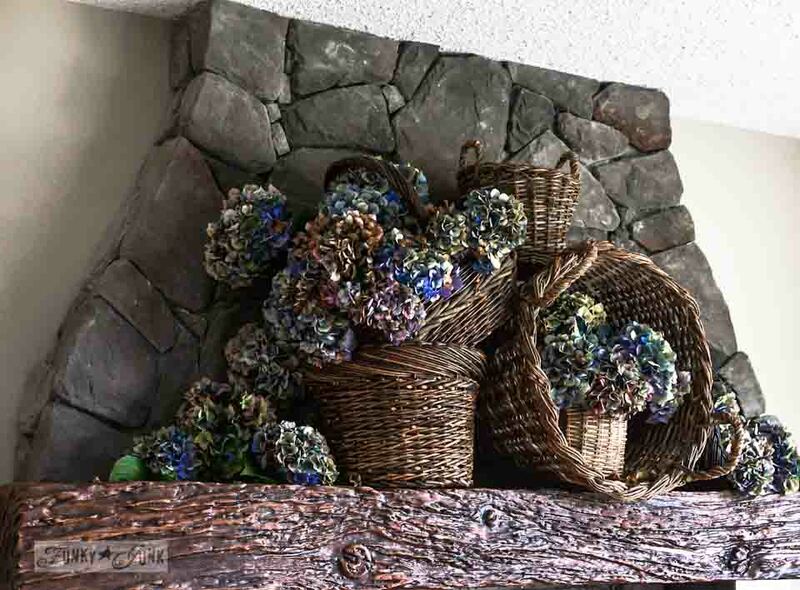 Make this 5-minute hydrangea wreath! I love your inspiring posts. I’m ready for spring and to see everything come to life again. Your pictures are beautiful. hi donna, i too leave my hydrangeas until spring. i live in northern new york so it will be at least a month before i am out trimming. my hydrangeas are all white (with a greenish tint). i so love your blue ones as blue is my favorite color. don’t see them much here. they are not as hardy as some others but i may have to invest in one. thanks for your tips. i loved your garden before but understand your need for simplicity. Hey Mary, you’ll be pleased to know, all my flowerbeds in the front yard have remained. In fact, I’m getting them enhanced a little, cut larger and adding new soil this year. More to come! P.S. I’d LOVE to add a white hydrangea bush to my own yard! Adore them. Ohhh I’d love a couple of limelights! I’d suggest to take a clipping to your local nursery and see what they advise. Then plan to test their theory out… do one half of the bush their way, and the other half a different way. You will then know! I have some weaker varieties in my front yard that need a little more attention too. I speculate the soil could be a big factor so will be adding some this spring. Glad to hear you are recovered enough to be bike riding again! Your hydrangeas have always inspired us all! 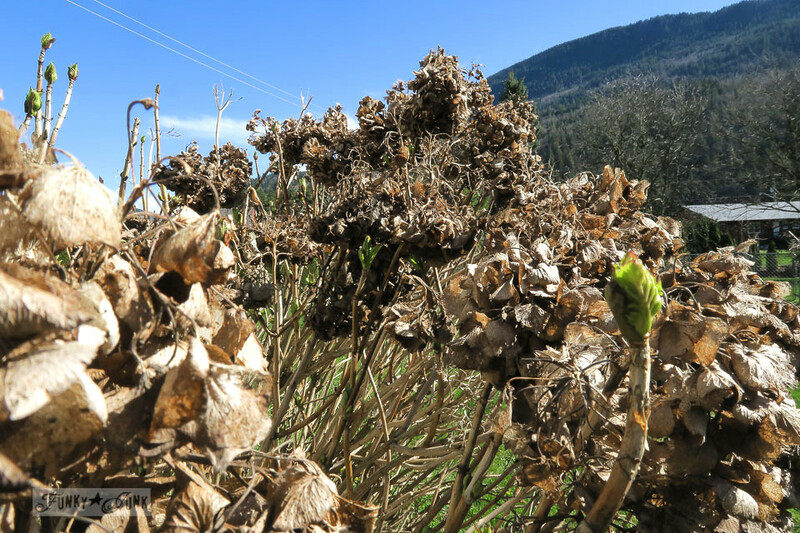 But just some clarification from this gardening girl…..Not ALL hydrangeas can be pruned this way. Some actually form blooms on old wood from last year. Pruning them your way will result in no blooms at all. These fall into the macroohylla familyrics do must be cleaned up just after blooming. So be sure to check the botanical name on the plant label. Thanks for your invaluable advice, Heather! I got my advice (that I don’t really follow) from a gardening book I had on hand, but the advice on the net is all over the map! ie: Cut to the ground for larger blooms… etc. I think it’s safe to say, if something isn’t growing to its full potential, dig a little deeper to see what could help. Taking clippings to a local gardening centre and asking for advice may be all that’s required. p.s. And yes, thrilled to be on the bike taking pretty pictures again! That is absolutely gorgeous Donna! I was just looking around my yard over the weekend and once again, thinking about pruning my hydrangea! I’m going to do it you way this year–it’s so much easier! I hope I get the same results! Of course, today we are expecting nearly a foot of snow so, on this first day of spring, I’m going to have to put pruning on hold! Oh dear. Are we done with winter yet?! Thanks for these tips. 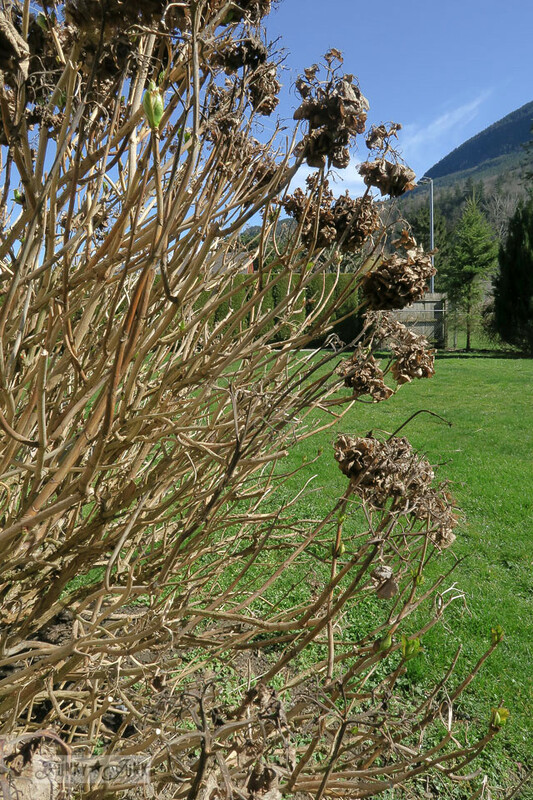 I have several hydrangea bushes and am always hit or miss on what I am doing, just mostly dead heading. I will take your advice and be a bit more deliberate in my care. I do agree, the less is best. Mine, too, are showstoppers and I am asked what I do. Basically I ignore them, except to make sure they get water. I find flowering bushes more my style, as I hate weeding. Spring is such a wonderful time of year. Love to you, Donna. I do the same with my grapes. The yield is incredible each year. And I NEVER prune them. Only to shape them enough to keep them off the ground. I love the ‘ignore’ plant species. They do well by me! 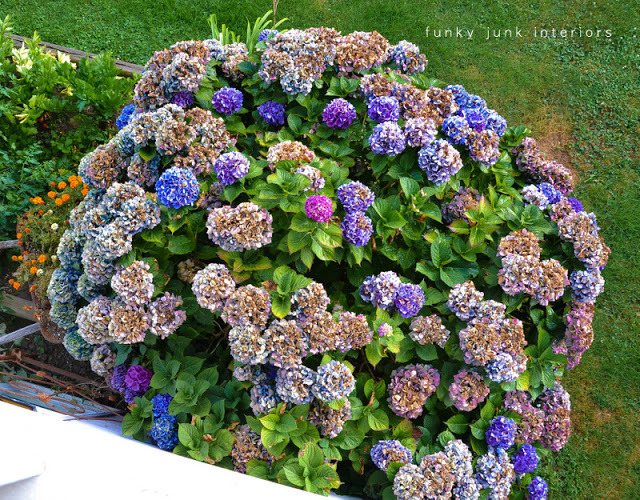 I think I have hydrangea envy…your hydrangea bush is absolutely beautiful. Your tips are really helpful. I live in southern Ontario so will have to wait until early May to start pruning my gardens. Your post has me anxious for spring to arrive. I have 3 bushes and they don’t do well. I’m wondering if they are getting enough sun? They only get a bit of morning sun. Is that the problem? Hey Sue, I’ve found my hydrangeas do best with some sun and some shade. The petals burn if the sun is too intense for too long. However too much shade has the blooms smaller and slow going. Yours may require more than just AM sun. 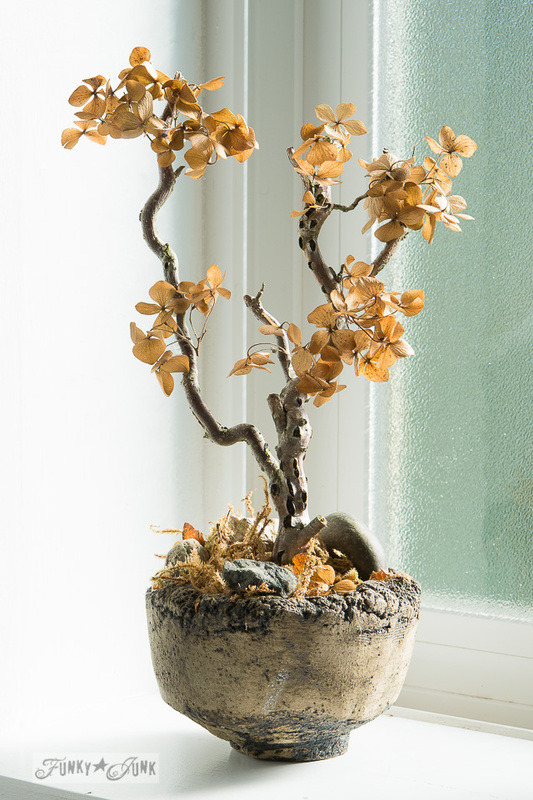 Perhaps plant a new one in a sunnier location to see if it helps? Not all hydrangeas bloom on new wood. 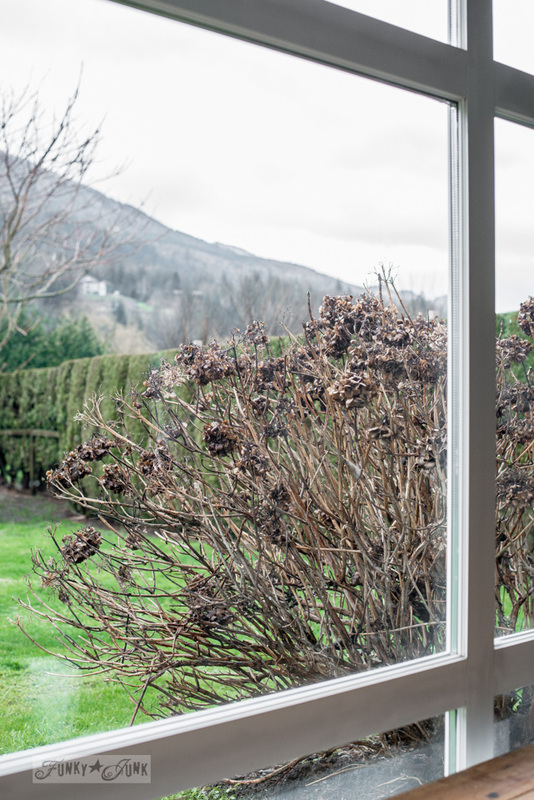 It is important for people to know what kind of hydrangea they have, and the proper pruning care. Thank-you Erica, I’ll reword my post to reflect this advice. Ahhh…the joys of being a homeowner. Pressure washing is a must every Spring here in the Pacific Northwest. I have to make sure DH gets if completed before the window washers come in May. The Hydrangea is one of my favorite plants. 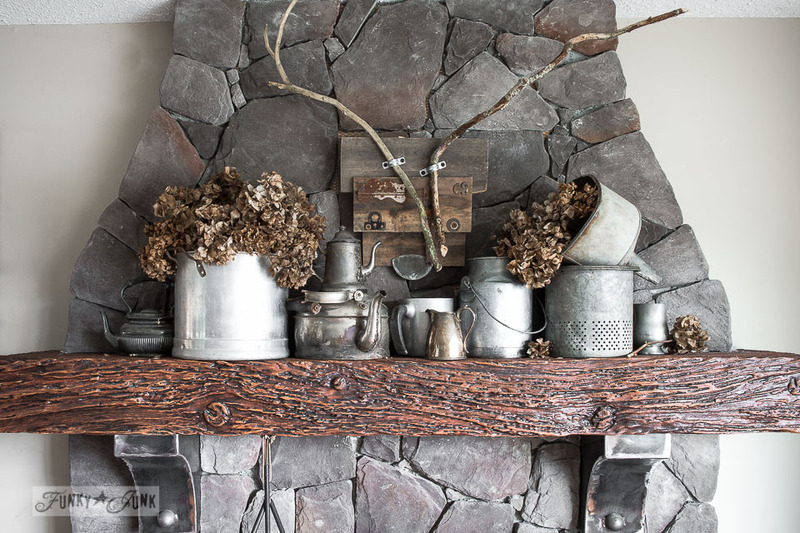 Their flowers whether fresh or dried are so versatile for decorating around the house. 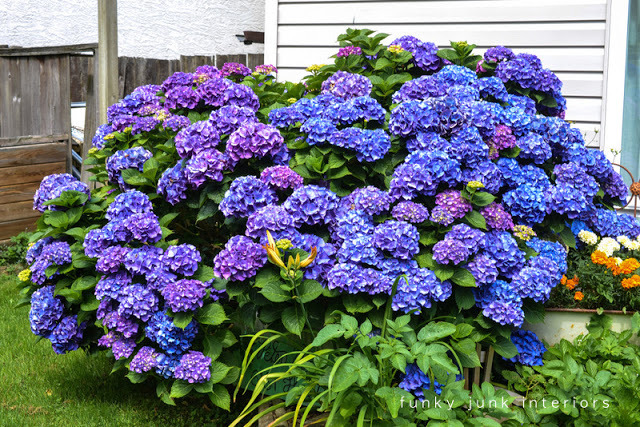 I’m with you on this, less is more, I have four huge hydrangeas and I have pruned all the way down to about six inches from the ground and they did ok, but if I just dead head in the spring, wow they are gorgeous. I’m like you I walk outside and just get overwhelmed and I have a hard time keeping my concentration on one thing (man I need help,haha). I call my help ‘bike rides’. LOL I’m obviously no help here! Great to know my method has been working for you too! I’m in Northern NJ and we’re having another nor’easter tomorrow so it’s nice to see something green. Thanks for this post. Your hydrangeas look great. The only reason I do not cut back my hydrangeas is because the old wood helps hold up the new growth. Especially when there’s big flowers, my hydrangeas tend to sag all over the place. Having the rigid branches in there helps keep everything upright. YES! Excellent reason to just dead head and walk away! 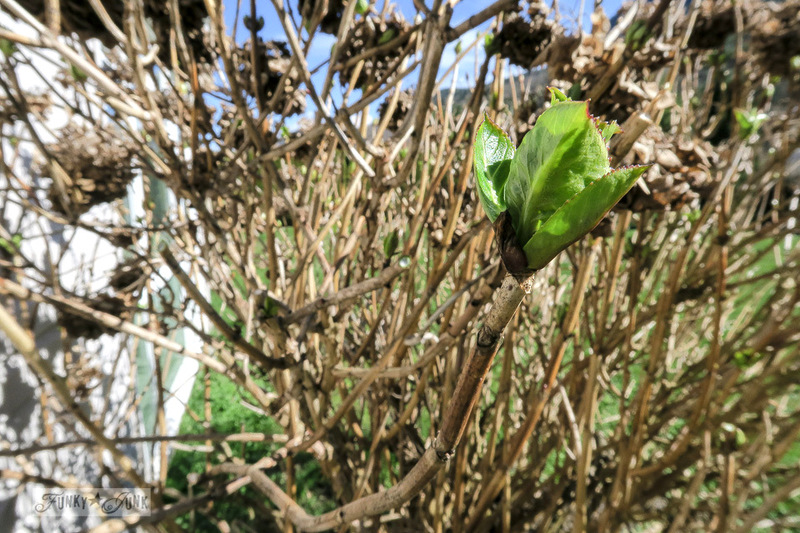 I guess we’ll see how my hydrangea bush does this summer without all the dead supports… ha! Hey Michelle! It’s my experience that they like fertile soil, in a partly sunny / shady location. The petals sunburn easily so I don’t recommend them in full sun in super hot locations. Where do you live? I love your posts. Hydrangeas are about my favorite flowers. I have only two bushes and I just remarked to my husband this morning that we should add some to my gardens. Beautiful blooms! Ha ha, Donna … I understand the feeling, but I was hoping my lawnmower *wouldn’t* start because there is so much other stuff to do! I’m heading out to look at my hydrangeas with your advice in mind! Thanks. We moved into our new house the first of December last year. We have a lot of hydrangeas. Some still have their flower heads on them and some are what look like dead sticks coming out of the ground. I have no idea what kind they are. Any tips for pruning? Hi Mary, I’d suggest to try what I did in my post, just prune back to the next bud. Perhaps a picture taken in to a local greenhouse can help guide as well? i have a hydranga in my yard was here when we moved her 3 years ago. its very big and green but has never bloomed. i plan to move it to anothers spot when is the best time to move it? Hi Rosalinda! My best guess to move it would be in either fall or spring. Perhaps check with a local greenhouse and see what they suggest! I keep reading about when to prune and realize you need to know the type. I have one bush, type unknown bc I did not plant it and it did not do well for three seasons, then last year, I left the wood until spring and started to see new growth at which time I pruned, and I got the most flowers this year (still only 6-7 flowers), but then I got 9-10 fall flowers that were not all fully bloomed when the bush was hit by winter. So I did not get a fully blooming bush to enjoy. I thought that was strange. What do you think? I also have two hydrangeas that I planted in another location. They are Queen of Pearls with the “mophead” white blooms. I have had those for two seasons with very little flowering. I am wondering if the third year will be any better. Based on what I have read, I plan to cut those all the way down in early spring. Is that correct? Is more feeding needed for those? Hi Cheryl! 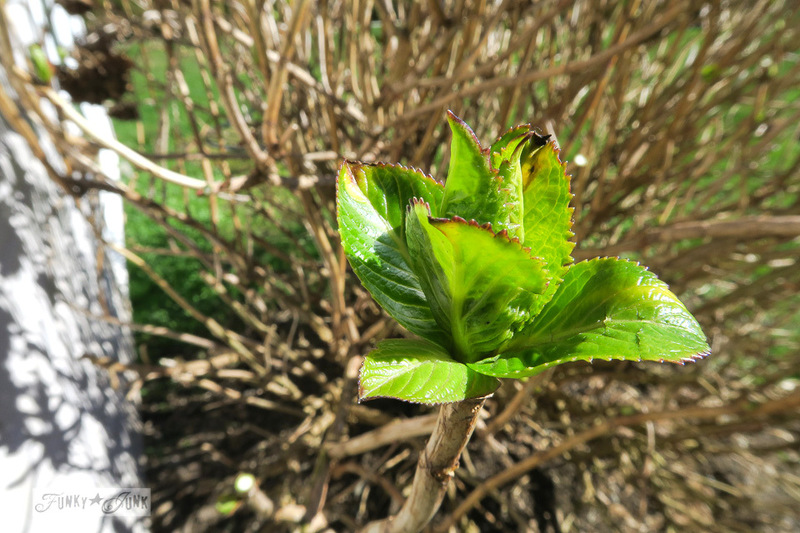 I have a rule of thumb when it comes to hydrangeas… if they aren’t blooming, I leave them alone for a few years to see if they start. They usually do! I’d suggest to check with a local nursery with a clipping if you’d like to know for sure.